If it is true that persistence always pays off, then Arkansas residents Vore must be rich by now. But then, I guess, when you play old school traditional war-and-doom themed death metal, and do it with little variation for the last 17 years, the riches may elude you. Still, with the consistency Vore continues to demonstrate, it is grossly unfair that throughout all of these years Vore remains unsigned, releasing all of those albums on their own. Gravehammer took six years to be delivered after the previous heavy hitter called Maleficus. All those years, and not much has changed in Vore’s outlook towards death metal, except maybe the sound got a little denser and crispier, courtesy of Colin Davis (Vile). When Gravehammer is played at its right volume (read, very loud), this music is going to vibrate your guts from the inside, tom hits sounding more like bass kicks for other bands. On the whole, the album is nine cuts of mid-tempo, bulldozing, rhythmically steady and militaristically inclined death metal in the vein of Bolt Thrower, Benediction or a more accessible, simpler version of Immolation. There aren’t many riffs to be found per song here, but every riff is crafted to make sure it reins supreme, so when Vore plays it, groovily, over and over (Doomwhore, The Claw is the Law) there is enough tension in these 6-8 min songs for the boredom not to set in. While all of these compositions are meaty, savage and catchy, the latter cuts (Throne to the Wolves, Sacerdotum Tyrannis) tend to be more atmospheric and adventurous (if that term can apply to Vore) in terms of song structure. On Sacerdottum Tyrannis guitarist/vocalist Page Townsley lets out more of his snarly blacker higher notes, as opposed to his “normal” guttural deathly voice. The first half of the album (with the exception of the short acoustic insert Uroboros) is dedicated to flatten and pulverize the senses. The Unseen Hand may sound a little more percussive and rocking, with swimming leads and brooding melody, before coming to a total crushingly headbanging end. But the cuts like Doomwhore, the title song and The Claw is the Law are built on full-on fist-pimping synchronized guitars/bass/drums riffs, which some may call primitive, but others will find orgasmic. Just enough of tremolo (title track) and ominous melody (The Claw is the Law) lift these songs after they have a chance to engrain themselves onto the psyche. 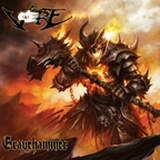 If you followed Vore prior to Gravehammer, this album is entirely predictable, and although not a step forward in terms of “development” or variety, it is still an improvement in their polished metronome tightness and steadiness. Not a throwaway weak track to be found here, but if you thought straightforward battle-ready death metal turned you off earlier, avoid Gravehammer like a plague. I personally enjoyed Vore before and this album is not going to change that.